I feel like I have abandoned y'all! My writing came to a crashing halt after publishing Dear Warriors. Today, I got back into the saddle again today, with a piece on my main blog. I titled it Abilities, Choices, and Opportunities and it covers a bit of my why's for not writing so much. Using this essay as a base, I could say that my writing abilities might be kind of strong, but my life choices in not getting a lit degree and not finding a network to get me opportunities to grow as a writer and advertise my books have led me to a pretty mediocre and low-key life. lol! I hope you are all doing well. I am doing better. While I did not market Dear Warriors as I should have or could have, I hope you, my main focus, have enjoyed the final product. If you have, feel free to add a review on Amazon. The more positive reviews there, the higher they push a product. Fun fact: this book is currently the 7.2 millionth highest selling book on Amazon and my book for teachers is 3.2 millionth. That's an incredible number of books and writers! Another reminder that most people never become famous or whatnot, but the act of just doing something has its own rewards. I'm quoting Dear Warriors on Twitter and Facebook more nowadays as I see the relevance in what we created to questions, comments, fears, etc that I'm reading from others. Feel free to quote the book and share parts to others as you wish (all I ask is that you please cite the book). I also still have extra copies I can sell for cost- just send me a message. In addition, if there are things you don't like about Dear Warriors, I'm open to hearing it! 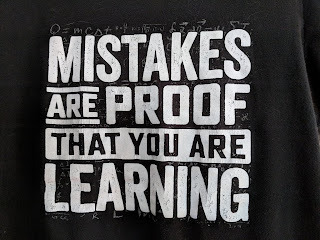 We learn from our mistakes and how I've said things may not come across as I intended. I wish you all well. While I've been quiet, I've not forgotten you. We're still together in this life, and I am much better for your influence in mine. I'm so glad to have Dear Warriors out on Amazon! That being said, it also means some of my faults are revealed to the world. Not only my diabetes management ones: this includes my writing ones. It's nerve-racking. Or nerve-wracking, as a variant or downright incorrect but widely accepted variation. See how hard this is??? I'm going to use this blog entry to post the mistakes in Dear Warriors as I become aware of them. I tried very hard to publish a work without errors, however, that has been an elusive goal for me. It makes me cringe and wish to never write and share again, but I will try to resist that temptation to hide. Why? 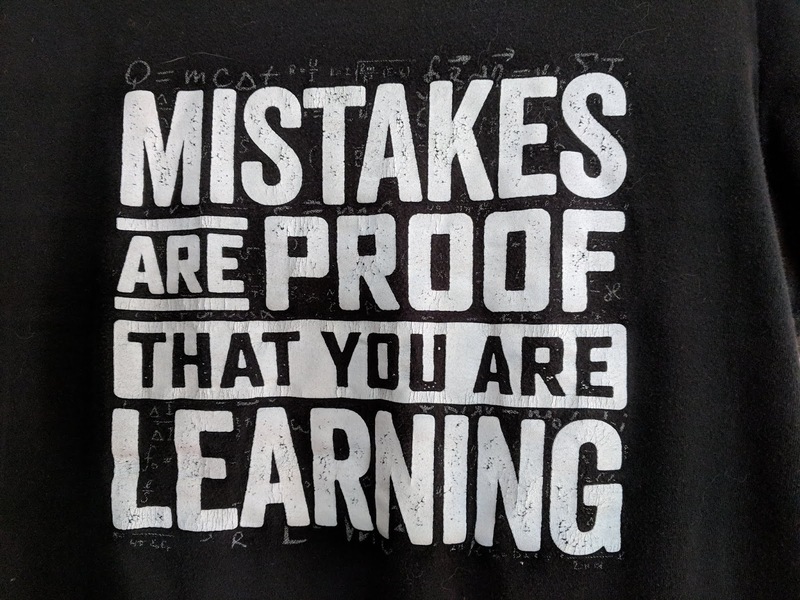 We only grow by learning from our mistakes. Therefore, I need your help!! As you read the book, please reach out to me at dearwarriors2018@gmail.com when you spot something that doesn't look quite right. If it's a new mistake, I'll post it here and cite your editing prowess with gratitude. I wish to extend my apologies in advance and thank you for your patience and consideration. I discovered that I mistyped Ashlee Kellogg's name once in her biography as "Ashley". I'm so sorry, Ashlee! I am pleased to present a current full section of my upcoming book, Dear Warriors, to you in its entirety. It's still months and hours of editing away from publishing, but I hope you enjoy it and I look forward to hearing your constructive editing suggestions and responses in the comments section or by email at dearwarriors2018@gmail.com. Lindsay drew this when she was probably 9 or 10. Lindsay May’s drawing made me think of my own youth. 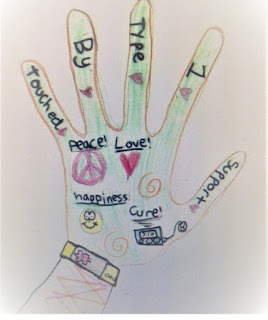 I remember countless times where we’d trace our hands or bodies for a variety of art projects. (What kid from the US hasn’t made at least one Thanksgiving turkey that way, for example.) 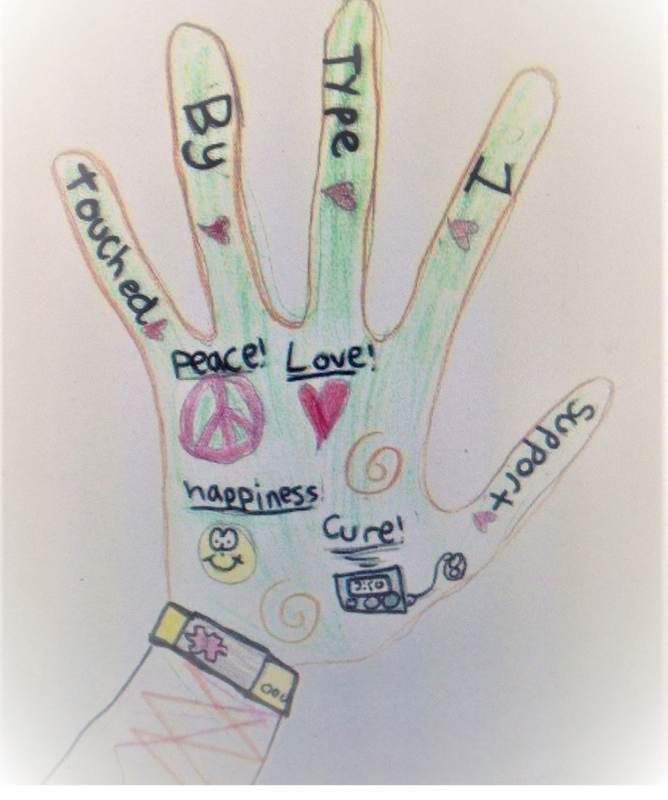 Our hands are a great starting point of expression. Lindsay’s is an old image of such a project, clearly created in response to a question on diabetes. This section, “Bringing the Warrior Together”, covers topics on how all of us can work with all our parts (body, mind and spirit) to build ourselves as successful Warriors. That “work” is a combination of our current conditions, sustained efforts, and our circumstances. Our parts are like building blocks that can be molded both individually and as a whole. Molded. Lindsay’s word choice was “touched”. Many things touch and mold us. None, by themselves, are us. 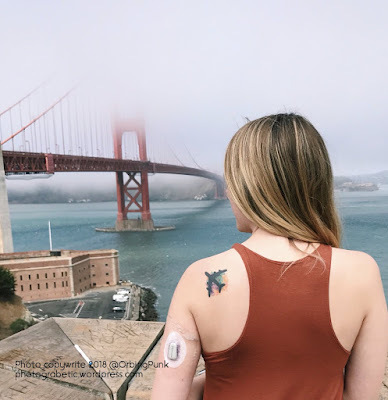 Considering her body, she drew physical items of diabetes (a medical bracelet and insulin pump) and a fix to her body so she would no longer have this physical condition. Her choices of “Peace!” and “happiness” speak of her mind goals- goals all Warriors can readily get behind. Her connections to spirit revolve around two concepts: “Love!” and “Support” from others. Every last one of us needs both of those! 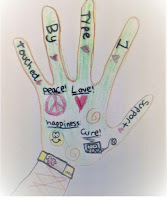 Peace, love and cure- one from each of our parts- are the three words she emphasized with exclamation points. And yet, only one of those is specific to diabetes. To me, the sweetest and deepest part of this image is the hearts. One on every digit. I wrote an entire essay on my hands and fingers that you’ll find in a few pages. Yes, we’re touched by painful things, including diabetes. All Warriors can also be, and should be, touched by love. From within and without. Hearts, hands, and happiness reminded me of another childhood memory: the old children’s song I’m using as the title. Do you also recollect its goofy cadence? I remember numerous occasions where laughter echoed about as we scrambled as a group through all kinds of crazy speeds and variations of this song. Parts. Hands. Hearts. Whole. Together. Now it’s time to explore how we can use all our parts together to be our strongest selves. There’s a Warrior at night in a cold, soaking rain. Although set in a huge city of dank, concrete and steel towers, they stand alone on a sketchy, abused corner. They fidget. Dark alleys cut left and right into unknown blankness, and while the gear is heavy, they embrace its weight. It’s solid and true. It promises relative safety. As the downpour continues, the Warrior wriggles to adjust the icy grip their fingers have on their backpack’s sodden straps. No point. Too hard. Doesn’t matter. Why bother. Why. Then the thunder rolls. You’re not good enough. You screwed up. You deserve this and then some. Give it up, you can’t do it and you never will. Huge what-if scenarios form in my mind: daunting castles from the tiny blocks of fear, frustration, anger and worry. The Warrior freezes in doubt. Warriors of all shapes and kinds face these real and imagined scenes all the time. How do we face them? How do we get through them? When life is bright, I can easily say and believe that neither the good nor bad will last forever. That’s when I, and all Warriors, need to pay attention and prepare themselves and their gear. Before the storms and darkness. Warriors face storms. Forests do, as well. Unlike people, trees are unable to move aside. They must have steady roots and flexible limbs to endure. Their networked branches can spread the burden safely and offer shelter. Those connections don’t happen overnight. Before the storms hit us, we need to prepare. We can pick from a host of options. Each Warrior can have a different system. In the first three sections, I described some ways to boost each of our individual parts. Coping mechanisms such as exercise, meditation, therapy, friends or religious groups are a few ways. The key is to have the lifelines in place before the need arises. That’s how we’ll maximize our chances for success. We know we’ll have dark days. Having our gear at the ready when the winds begin to howl will help us curtail the duration and intensity of the tempests. I noted in the first section of this book that I was glad to have more flexibility in handling the many facets of diabetes. Now I’m going to make a testimony on the benefits of regular rhythms in everyday life for all Warriors. Patterns can help get our three parts working in harmony. Patterns. Synchronization. In grand scale, I picture the marching bands and color guards at high school football games, flights by the US Navy’s Blue Angels or the performances of music groups like South Korea’s BTS. These are extreme examples where individual Warriors come together and become larger than their parts. There are far more common ones that any of us can experience and relate to. There are rhythms everywhere. Sunrise, sunset. Seasons. Hours tick by: tick tock tick. Sometimes we can get so frustrated with the speed or slowness of time that we lose sight of a simple fact: we can use time to our advantage. For example, I’ve taken up running in the last couple of years. To be honest, I started despite the activity itself. I didn’t like the idea, nor think it even possible to, run. Miles? You must be joking. Still, I wanted to try. I began with a song that naturally stirred my body. 3:42 of running? Don’t be absurd! Try 30 seconds. Then walk another 30. Repeat. Good. The next time, I had a 5-song playlist. I told myself to just walk and feel the rhythm. With the help of an app, I was cajoled to pick up the pace and really follow that music’s beat with my whole body. I sang along in my head. I sang aloud to the sky. OK, actually, I gasped. My mind was forced to pay close attention to my feet, breath and arms to match the cadence pumping into my ears. Time finally started to pass. I’ve shared my successes with friends and within the next year, I will run an official race with one of them. That goal feels good on another level. I’m not telling you to run. I’m giving you a reminder that anyone, even me, can find a rhythm. Something that works for you. My beat is not your beat. It can cover anything in your day: when you eat, how you eat, when you sleep, when you move. You decide. You have the power. Chances are, you may have to tweak your rhythm as you discover what really excites and drives you. That’s another gift of embracing rhythm: you quickly see what works and does not for you. You get the opportunity to fill your days more and more with what matters most to you. All because you follow a rhythm and embrace its magic. I need to say it again: nothing lasts forever. Nothing. When I initially wrote this essay, my healthy lifestyle was slipping from my grip. Exercise was down. Weight was up. Energy levels and excitement were both plummeting. I was shook, and not in a good way. Not like when I’ve just seen my favorite singer in a fantastic performance way. This was an unnerving and frightening way. It felt like my foundations were crumbling and my life’s building was swaying wildly. The worst part? I couldn’t figure out why it was happening or how I was going to stop it. Sound familiar? Warriors get rattled and lose their focus. One thing I’ve learned over the years: we can’t force that connection and balance of our parts. This frustrating angst I was feeling was a product of my parts falling out of balance. My mind, body and spirit were jangled. Several months had passed and as I reviewed this piece, I found myself at a different point than before. Some up. Some down. Some the same. Some a bit better. Evidence in the very writing of the subject at hand. Right now, I am feeling better. The despair has lifted, even if my circumstances are still not 100% where I would like them. That’s the thing: warriors face obstacles. I have no idea why, but sometimes we slip. That goes for every human out there. It can be no big deal. It can be dangerous. But it happens, despite our best intentions. In a mission, getting distracted by “why” can pull a Warrior off the performance of the task at hand. Let’s accept the bumps. Eventually, things will change. How do we get our balance back? Or, rather, how do we get a new balance established? I have yet to find a single solution. Opening to those around us is a big way, and that was part of my change this time around. Admitting our problems to our network will allow our family and friends to give us help. Reflecting can lead to renewed commitments. Relaxing our expectations can allow for clearly vision of what truly is as opposed to what we THINK is. Experiencing new things can even bring us back to our roots: we can appreciate what we used to take for granted. We must believe that the clouds will lift, and the sun will shine again. Hope renews our commitment to our Warrior selves, no matter how far we fall. We need to believe that things will click together again somehow, and that we will rise once more. We’ll slip. We’ll fall. How we’ll get back on track will come from any number of directions. Sometimes, we’ll get a boost from the inside. Other times, it comes from those around us. At others, it will come from far distant lights of inspiration. I know this from experience. I had a turn of mind from a direct message in a Tweet. A tweet! Sometimes, we absolutely must seek professional help in getting through it. Even if we think we can manage, if other Warriors tell us they are concerned, and we respect their judgement, we should listen. Why? We are both on the field together. They need us at our best, just has much as we deserve to be that way, too. The funk is real. Let’s keep reminding ourselves of our worth and speaking that to others so we can save each other somehow. Of the 7.5 billion or so people on the planet today, I’d say my life registers a “5” on a 1-10 scale of success. I’m better off than many and not as well as some. I’ve done nothing of any real consequence: no parks or animal species are named in my honor. Yet, when I can be confident, I feel good looking back at what my story has been up to now. This quote talks of carrying away stones, implying the mountain is an obstacle to be destroyed. I’d like to turn that idea a bit. Mountains exist both before us and after. We Warriors take a raw challenge (the original mountain) and through effort, we transform it into something that is refined and ours. We make a new mountain. What do I mean? Let’s take a look at the world of music today. Pick an artist you enjoy. That artist may be cutting edge. However, their art is built upon the art of musicians near and far. No musician is without muses or inspirations. The genres we see in India are colored by influences from an array of the Western ones and from within other Eastern cultures. Songs coming out of the US and Europe today have flavors from around the world, as well. One mountain moved. That mountain has been moved, and so forth. Sometimes we may argue that we haven’t moved anything; there are no mountains or note-worthy accomplishments in our lives. However, they are there if we look. Friendships. Art. Medical milestones. Children. Careers. Mountains can be moved and formed by individuals or groups. Therefore, my mountains aren’t necessarily yours (but they could be) and yours could be insurmountable by me or, on the flip side, built with the help of others, like me. Our mountains move with day-to-day effort. For Diabetic Warriors, the small stones include testing regularly, eating well and exercising. Staying hydrated and finding time for things we enjoy are also stones. As is sharing our stories. When we do these things regularly, we’ll move a ton of stones. That allows a feeling of accomplishment, which in turn, allows us to wake up in the morning, revved up for another day to move even more. This work we Warriors do isn’t very glamorous many times. It’s perhaps not thrilling. However, it’s part of every life. It’s hard. It’s valuable. It’s respectable work. Our work moves, builds and reforms reality. Let’s not be blind to the pebbles. Let’s not forget the importance of those stones that make up our living. It’s a huge accomplishment and worthy of acknowledgement. We don’t necessarily want to build them, but these mountains are ours to claim. We’ve earned every last stone. Yes, I’m using a quote about love when I’m asking about why we have to be Warriors, Diabetic or otherwise. Why. Why? Why?! It beats at us in the darkness. This question can fill our days and nights. It can burn our minds and hearts. Anyone who has ever loved anyone for any amount of time knows what Shakespeare is talking about. Love isn’t easy. It’s messy…and wonderful. It’s frustrating…and inspiring. It’s painful…and blissful. It never runs smooth. Or, at the very least, it doesn’t do so for long. Love and life. They are one. Warriors know success, hardship, and defeat. Trees sprout, grow, crack, and eventually topple to the forest floor. Life is rarely smooth. We can have periods of ease, but just as the warm dawn comes after night’s chill, there is always change. Just as our children are mewling, soft lumps one minute and edgy, gangly teens the next, all things evolve over time. Why? As Shakespeare implies, because it must be. It’s not what we want to hear. We crave solace and solutions. Comfort and stability. However, the course of true love…and life…never run smooth. If it did, we’d have nothing to compare it to. Alas, without struggle, perhaps it would all collapse due to ennui. Boredom. Dull indifference. The universality of two concepts, pain and change, can be our salvation. We can understand another’s struggles because we’ve been there. We can help other Warriors when we’re not the ones in crisis, because we know we can alter conditions. We know from experience that we can grow and cause change by our actions. We can suffer through the lows knowing two things: the bad can end and that we have other Warriors backing us up. Notice my use of “can” through that last paragraph. It’s all in our choices. Our accomplishments and our outcomes may feed another’s need tomorrow. Even our failures can end up being a gift to us or someone else. I’ve gone through several career changes because I’ve failed. Without those, I would not be where I am today. I still have opportunities today, despite those “failures”. We have to be willing to risk the roughness. Our missteps and failings may lead to an unknown good in the end. We won’t know and we won’t be able to predict what will be. However, if we try, we can succeed at something. It won’t be smooth, but it will be life, and it can be loved. It's been over a month since the last official update on Dear Warriors. As I get closer to going live, the hard realities and anxieties build. Worries that it's all a pointless endeavor that I should abandon. Unexpected expenses that make not having a "real" job and am "just" a writer, more hard to justify. Crazy grammar and spelling mistakes that make me feel about 2 inches tall... It's harsh. But still, I press on. All art is locked in and accounted for. (And so eclectically cool!) Artist biographies are almost complete. The first file is at Createspace for review. The first proof will be available soon. If you're willing to read a section and give some specific feedback on what works for you and doesn't, please consider emailing me at dearwarriors2018@gmail.com and I'll arrange a hard-copy mail or electronic file drop. If you know of someone else who might like to take a look at an advance copy for similar review or to do a quote-worthy blurb for the back cover, please pass this request along. Family, friends, medical folks you know...it all adds up to furthering my writing skills and the reach of this work. We're so much stronger together. I wish you all the best as we move forward doing that: working and being together as Dear Warriors! UPDATE: I couldn't wait. I posted a copy of a section within Dear Warriors. Check it out: Bringing the Warrior Together. Would love to hear your responses!! I've shared a rough of the the introduction to Dear Warriors. Now, I'd like to share a possible ending. Please leave comments if you have a response, suggestion or question! Deadline for art submissions is July 31! I'd love to see your work! I’ve covered hockey twice, now I’m moving on to speed skating. I was shocked by the shape of Lee Seung-Hoon’s feet when he showed them to the hosts on this show. Years of workouts had caused his body to protect itself in a spectacular fashion. He explained how he had pushed himself from elementary school age, resulting in the callouses and him experiencing such exhaustion, he truly felt he couldn’t take another step. However, he practiced a mindset of “just one more”, and that led him to eventually winning gold. Pushing ourselves. Just one more. We Diabetic Warriors know of this. I was struck as much with Abby’s life story on her photography blog, photograbetic.wordpress.com, and the background she gave me on this shot, as I was the atmosphere she created in this photo. Her composition is a serene and soft one of San Francisco. Our view is clouded by both fog and subject. Abby is standing tall, looking outward at a half-seen expanse, and our focus is drawn to her, realizing that she is flying off to amazing places like the tattoo that adorns her body. She’s pushing her boundaries and exploring the world, using her body, passions, grit, family support and the tools of a Diabetic Warrior. Is everything picture-perfect and well defined for her? No. But all of it make up who Abby really is. This is the body, mind, spirit and tools acting as one. We are behind Abby. We are also Abby ourselves- in our own ways. There’s a laundry list of dreams we Diabetic Warriors have and chasms we must cross. It’s a long race. We, like the speed skaters, go around and around and around, over and over again. It can be mayhem. However, we also have quiet moments, like this one captured by Abby, where we can contemplate our journey- our race- past, present and future. I believe I’ve covered quite a few of these struggles within these pages. I hope I’ve also highlighted some goodness, skills, and light that we, as Diabetic Warriors, can share and practice with fellow Warriors of all types. Abby looks alone. She is not. Fellow Warriors stand tall with her. How do I know this? I live this truth. 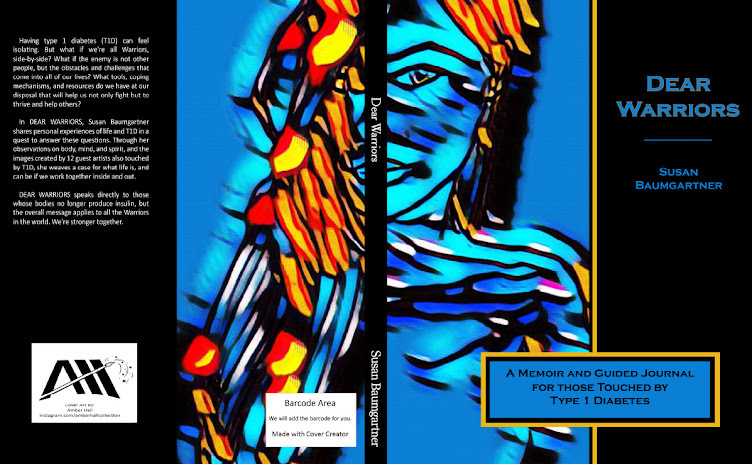 I had a ton of help in getting this book finished, for which I want to express my gratitude. First, to all the artists and their families. You have come to me when I’ve needed you and in amazing ways. Next, to early readers and editors, including my neighbors and friends, Marlene Oswald (the keystone to Dear Teachers), Amy Manns and Dr. Kathy Phelan. Special thanks to Audrey Farley, Editor of InsulinNation, to the folks at BeyondType1 and the members of the Facebook group, The Diabetic Journey. When I reached out for ideas to improve this book’s message, you all went out of your way to offer advice and assistance. I thank you for reading. I thank you for expressing yourself on these pages. I thank everyone who has challenged my perspective and understandings. I thank everyone who has distracted me from my pains and put a smile on my face by telling me their own stories. I thank everyone who has shown me that I’m not alone. I hope we can keep the sharing going on my blog, other social media and in person. Writing this book has not cleared away my inner demons, but it has given me some clarity and patience. In myself and in others. It’s revealed some truths I hadn’t faced but needed to sit with and which I must still work with. Over time. That’s the key. With time, almost anything is possible. Time gives us opportunity. To try.